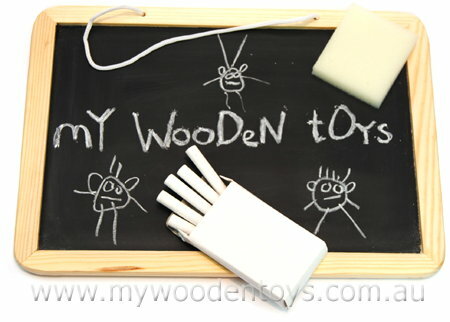 Blackboard Chalk and Duster is a classic chalkboard with a simple wooden frame and nylon string hanger. This traditional Blackboard comes with five pieces of chalk and a small foam duster. This Blackboard is a great size to hang on a child's door so they can leave messages or play school. The Blackboard has a great finish and chalk takes very well and easily on it's surface. Material: Wood and Child-safe paint. 5 pieces of chalk, Foam duster. We like this because: "Simple, classic toy well made and inexpensive."